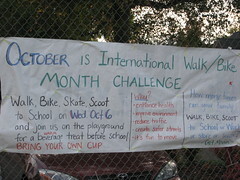 We’re kicking off Walk to School Month on Wednesday at our kids elementary school with some hot beverages and tasty snacks on the playground. 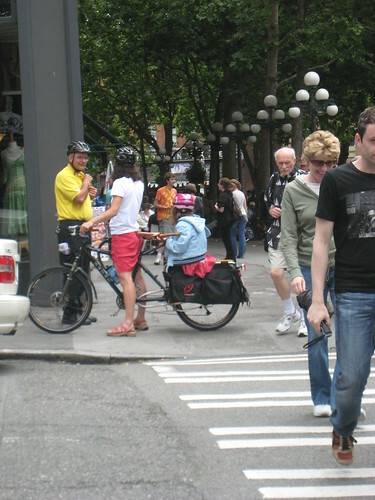 SEATTLE, Washington (August 3, 2010) – On Sunday August 15th, from 3-6 PM, at John Stanford International School (just two blocks from the Burke Gilman Trail in Wallingford), local family cycling advocates will present Seattle’s first Fiets of Parenthood Family Cycling Extravaganza. Meant to celebrate and inspire families going by bike, this free event will feature a kids’ bike skills race, parent/child family bike obstacle course, bike decoration station, “Gelato Bike,” and a bike raffle for a stylish cargo bike from Globe Bicycles, with proceeds to benefit Bike Works in South Seattle. Spoke and Food is tonight, June 29th. Ride your bike to dinner and 14 Seattle restaurants will donate a percentage of their profits to Lettuce Link at Solid Ground. On the evening of Tuesday, June 29th, we invite you to bicycle to and from one of the 14 Seattle area restaurants who have all agreed to participate in our event. In support of our event goals, the participating restaurants have also agreed to donate a percent of the revenues they receive on the evening of our event to the non-profit organization we have selected to support. This year’s non-profit is the Lettuce Link program at Solid Ground. Don’t forget to check the participating restaurants before you make dinner plans tonight! “Elusive blogger”, Eben Weiss, will be at University Book Store on the Ave. this Saturday, June 19th at 2:00 PM to promote his book. In this event benefiting the organization Bike Works (which encourages sustainability and activity in young people by teaching them about cycling), NYC’s elusive blogger BikeSnobNYC will read from his new book and help us out with a raffle of gifts from Knog. Cyclists of Seattle, unite for the event. You have nothing to grease but your chains. Tim and I (whom Eben would categorize as Mr. and Mrs. “Laden Righteous Cyclist” ) plan to pedal on over and check it out–we hope to see you there too!